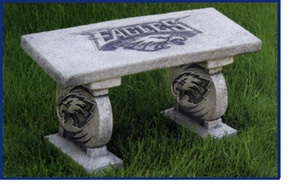 Massarelli’s introduces the NFL 2007-2008 STARTING LINEUP OFFICALLY LICENSED BENCHES with your favorite NFL TEAM LOGO adding personality to your indoor or outdoor decor. Each bench is hand crafted and hand painted in the USA. 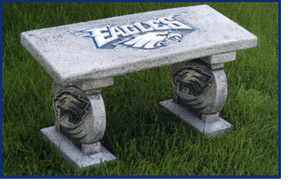 All benches are make of Light Weight cast Stone, a perfect addition for your home or garden. The Touchdown Style features a unique Old Stone Finish background and boasts a fully detailed logo on the bench top and both sides of each leg in your favorite team colors. The Field Goal features a fully detailed logo in your favorite team colors on the bench top only. The legs are features in our Old Stone Finish. The 1st Down is completely painted in our Old Stone Finish. Team logos are not detailed in full color.